Finally a relationship game changer! 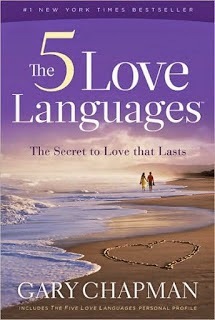 The 5 Love Languages by Gary Chapman was highly recommended to me and has already changed my relationship for the better. There is nothing earth shattering in this book, however it introduces a different way of thinking and outlines exactly how to speak your partner's love language. Before you even read the book, take the quiz in the back. There's one quiz for wives and one for husbands. After you and your partner take the quiz it'll tell you what your love language is. What I found so interesting is actually seeing what type of love language we have. I'm acts of service and physical touch, whereas Tony is words of affirmation and quality time. We are complete opposites and have such different love languages. After reading the book, I now understand why we've had the fights we've had over the past 10 years. I know what I like/need from a relationship and I thought Tony was the same...WRONG. In each chapter, the book details what your spouse needs depending on THEIR love language, not yours. With our infertility struggle, selling/buying a house and moving, and Tony's new role at work we've both been so stressed out and haven't taken the time to focus on our relationship. It's only been two days since we've read this book, but I already feel connected again. Moving forward, instead of getting frustrated with each other, we need to remind each other when our "love tanks" are getting empty. This will signal to the other person to try a little harder and use some of the tips outlined in the book. Want the secret to love that lasts...GO READ THIS BOOK!! !